From our friends at PBS comes Fetch! Lunch Rush, a very unique FREE math game app for iPhone/iPad. In this multi-player game, it is the students’ task to keep up with the lunch orders from Ruff Ruffman’s movie crew. 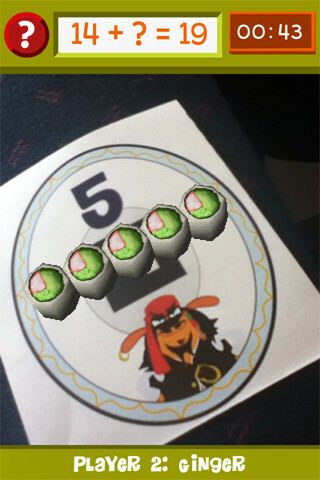 The challenge is to keep track of how many pieces of sushi everyone wants by adding and subtracting. Before the game begins, game pieces have to be printed from the PBS website and distributed around the room. As the sushi orders come in, students have to find the game piece with the correct answer to the problem. Using the camera lens on their device, they focus in on then tap the sushi. The sushi pieces magically move to the table in front of their character (as seen above). Students have to think fast and keep moving to fill all of the sushi orders before their friends do. What a fun educational app!